I’ve always liked creating things. In college, I designed and built a “water screen” where slides and films projected onto a sheet of falling water. It had one public appearance, and a lot of people got wet! But they were mesmerized by the 3D images that shimmered through the water. I witnessed the power of entertainment that night. And water became a recurring theme for me as a swimmer. I started young, swam on a scholarship at the University of Texas, became a National Masters swimming champion, and was even considered one of the fastest swimmers in the world at one point (for my age). So swimming is also part of my story. One day, I started talking to two swimming friends, and we decided to create a magazine for adult fitness swimmers. I started out as the art director but soon discovered my editing and writing skills. English is my second language, but I picked it up easily when young. And I put that to work in writing dozens of articles and feature narratives. Eventually, I was in charge of creating all the editorial content for the magazines. That was the start of my professional writing career. Over the years, I would also visit New York City many times, and on each trip, I’d stop and stare at the waters encircling the island of Manhattan. And think back to the day I swam around it. And how, while I was treading water at the island’s tip, waiting for the tide to change, I looked up and wondered: What was this place like before? Before the tall buildings and the crowds. When forests covered the land. When wolves stalked their prey. When a few hundred native Lenape people called it home. What would it have been like then? I mean, really like? Well, I’ve now written and published that story. About the birth of NYC and Manhattan in the 17th century. 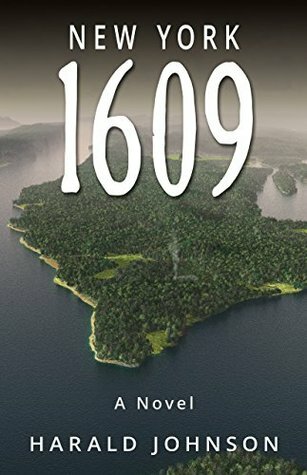 In fact, the consolidated edition of New York 1609 (and the four shorter ebooks of The Manhattan Series, on which it’s based) is now available on Amazon. Peter: Harald, it was a pleasure to get the opportunity of reading your epic book New York 1609 (Omnibus). I am delighted that we have the opportunity to conduct this interview to ask more questions about your novels, plans and your writing experience. Many thanks for making the time available to answer these questions. Harald: Two main reasons. First, I have an unusual connection to New York City, and especially Manhattan where NYC as the city we know today really started. Second, because no one had ever written a historical novel about the birth of NYC from its earliest beginnings before, as hard as that may be to believe. I couldn’t believe it myself until I confirmed it with the New York City chapter of the Historical Novel Society. As a child I immigrated to the U.S. with my parents from Germany in the 1950s. And although I didn’t know it at the time, we traced the same water route into New York Harbor that Henry Hudson had followed on his exploratory voyage of 1609. 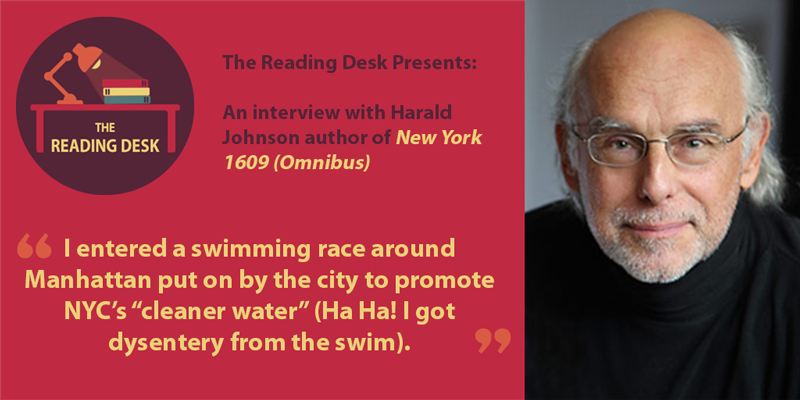 Then, 30 years later I entered a swimming race around Manhattan put on by the city to promote NYC’s “cleaner water” (Ha Ha! I got dysentery from the swim). And as I waited for the tide to change during that race I remember looking up at all the tall buildings and wondering: What was this place like before? I mean, *really* like? At the very beginning? It all fell into place when my Mom sent me an old photo album of our early transatlantic voyage with little B&W photos and her handwritten descriptions under them, and I started thinking about the long thread of history relating to New York, and my place in it. I’ve always loved historical fiction books, so I searched for novels about how New York City got started. When I found none I decided that I would write that book. Peter: You tell the story through the eyes of a Manahate Indian, Dancing Fish. What were your hopes and plans for this character, and did he start to take a life of his own? Harald: I decided early on that I wanted a main character who could cover the transition of Henry Hudson’s arrival (1609) through the early years of trading, settling, and finally, extreme conflict (Kieft’s War, 1643-45). This was the 35-year time period that really molded the character of NYC, and which had never really be covered before. And one obvious way to handle this was from the POV of a Native American character who, in essence, grows up to see it all. And yes, Dancing Fish definitely became a full-bodied character to me as the story developed. Peter: You created several important characters that illustrated the best and worst of human behaviour. How important was it to be balanced with your characters yet remain truthful to actual events? Who was the most challenging character to develop? Harald: First, I had to be accurate as to the historical record. Certain historical characters were known to have good and bad behaviors during this time period. I used that knowledge to fill in the gaps and to create a cast of characters that comprised both real and fictitious people on both sides of the conflict. My main guideline comes from author Ken Follett: that events either *did* happen or they *could have* happened. The same guideline applies to the main characters. My main protagonist, Dancing Fish, was probably the most challenging character to develop for several reasons. First, he had to pass through the different stages of his life. Also, he had to learn the languages used in the book (English, Dutch, French). So there was a continual evolution of the main character throughout the span of the story. Peter: It is very clear that there was a great deal of research went into the background of this book. Could you share with us some of your main research and parts that surprised you? Harald: This was a multi-year project, and I consulted numerous information references from both Native American and European sources. This included history books and articles, maps, memoirs, various language dictionaries, and onsite visits and consultations with experts. I think what surprised me is that nothing really surprised me. People are people no matter what or when. Peter: There are some serious societal, racial and political messages in this book. How important was it to convey these messages, and do you feel many of these issues still exist today? Harald: This gets into the concept of Theme. And my overall theme with this book is that under our skins, we’re all basically the same and have been for hundreds—if not thousands—of years. We all love, loathe, dream, and fear. Equally. Peter: Do you use storyboarding or a mapping processes to develop your plots and interactions, or do you go with the flow and follow your instinct and gut feeling? Harald: I’m a plotter/outliner and I want to make sure I have the main plot points under control. But I am also very open and willing change things as I go along. I understand the basic architecture of classic storytelling that has been with us for millenia. But within that structure there is plenty of room for instinct and adjustments. The belief that you must be either a “plotter” or a “pantser’ is mistaken, in my view. There are many opportunities for mixing and matching, for using your creativity in the process. Harald: While I may not “write” every day—i.e., writing actual story text—I do something related to my books and authorship every day. That may include doing research on my current WIP (work in progress), doing some kind of marketing/sharing for my latest book (like this interview ;-), tweaking my current WIP outline, writing in my personal journal, or doing actual scene writing. So it’s a mix of activities that move in and out like the tides. Peter: Do you use particular software applications to support your writing activity? For example, Scrivener or Grammarly. Harald: I use Google Drive/Docs for my main writing and also for timelines, character arcs, outlines, and much more. I have a large desktop monitor and have multiple windows open with multiple tabs in each. I find this very efficient for my needs. And yes, I’ll do a final run through Grammarly at the end before I dive into production (see below). Harald: Although I’ve been traditionally published in the past, I decided to go all-Indie with New York 1609. 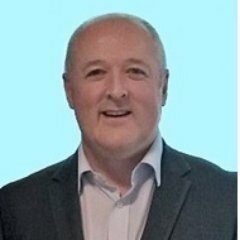 This means that instead of going through the tedious, and many times frustrating process of sending out queries or manuscripts and waiting and hoping—sometimes many months—for a gatekeeper (agent or publisher) to take you on or reject you, I’m just skipping all that and going directly to readers. The main benefit of being an Indie for me (besides speed-to-market) is ownership and control. I own and control everything. I can change the pricing, the cover, whatever I want whenever I want. And I can license/sell any of the underlying rights on my terms (audio, TV/film, etc). Try that with traditional publishing. And where a traditional publisher may generate higher sales in the beginning with their distribution and promotional connections (there is still anti-Indie bias out there), they will quickly stop paying attention to a non-skyrocketing book, and I’m better off in the long run with my higher royalty share as an Indie. Yes, it’s more work to be an Indie, but I like to work ;-). Harald: That’s easy: 100%. Or close to it. The only thing I job out is the substantive and line editing; I need other eyes for that. And if and when I do audiobooks, I’ll work with a professional narrator for that as well. But other than that, I design my own covers (I’m also an design/art director), do all the formatting/design for the ebooks and paperbacks, create all the promotional material, and do all the marketing. Harald: As stated above, I like to mix things up. I might go for days doing nothing but writing scenes, and then shift to marketing. Or, I might write a scene in the AM and spend PM on promotion. Overall, it probably ends up being roughly 50:50, which works for me. Harald: I have a two-part answer. For authors in the historical fiction space, I admire and study the greats: Michener, Follett, Rutherfurd, Mantel, et al. The other part is for the pioneers in Indie publishing who very much inspired me to take that fork in the road. Authors like: Hugh Howey, Andy Weir, and Amanda Hocking. Harald: That’s a hard question. Apart from the many nonfiction books I’ve read as part of my research, one recent book that really jumped out as pure page-turning joy was “Dark Matter” by Blake Crouch. It started off as competitive research for my current WIP, but it ended up being just a darn good read.